Probably the best performance on the Alphasphere Nexus is this one by Jason Hou. One of these surfaced on eBay the other day and I couldn't resist. It's great! I love instruments that allow me to approach music-making in a new way. 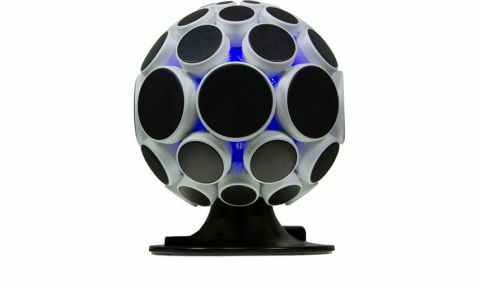 I also put in an offer on another glowing blue MIDI orb; the Naonext Crystal Ball...and that's turning up next week. This thing is based on a set of light sensors; it's like D-Beam for octopuses. I'm going to be pretty much all orbed up with these. Need some videos of you 'playing' these! Looks very funky. I assume it's just a midi generator and could be mapped to anything? Made me think of a Hang too. Nice either way. ...oh, really...? I'll have to add that to the list of desirable-but-unobtainable, along with the Buchla Lightning and the S-Wave concertina. I just got round to trying out the Crystall Ball (sic), so here's an equally short, grainy clip of that. That was the world's worst demo. But it's potentially quite an interesting piece of gear, despite the lack of YouTube videos showing anything more than people waving their hands around to apply random FX. This, I believe, worked on the same principle, but with a lot more sensors. He's not building these commercially however; the only device he currently has on the market is the Air Harp. 2 weeks 13 hours ago.